NASA recently released a Digital Model of Asteroid Vesta, a 3d map of one of the largest asteroids in the asteroid belt. 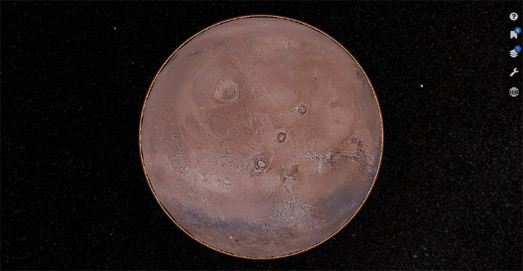 They have now used the same technology to create a 3d map of Mars. NASA's Mars Trek includes the option to explore Mars on both a 2d and 3d map. The 2d map includes a number of map views, including infrared and thermal imaging layers. The map also includes a number of 'bookmarks', providing quick links to zoom in on sites on Mars, such as the landing sites of Curiosity and Opportunity Mars rovers. The map search option allows you to search for locations on Mars by name. A tools section includes measuring tools and the option to view the overhead position of the Mars Reconnaissance Orbiter, Mars Odyssey and Mars Express.